It’s a great pleasure to join you here today. Let me express my thanks to the Governor of the People’s Bank of China for hosting us, and to all of you for joining in this timely and thought-provoking conference. This morning, we heard an excellent overview of the global economic context, and we explored the characteristics of China’s growing bond market – which is now the world’s second-largest. In my remarks this afternoon, I’ll discuss the IMF’s most recent assessment of global financial stability, and some of the challenges that we now see for financial stability worldwide. The IMF’s Global Financial Stability Report, which we published last week, found that, while global growth momentum remains strong, short-term risks have increased recently amid rising trade tensions, while medium-term risks to growth and financial stability remain elevated. The main challenge for policymakers is to address financial vulnerabilities, without undermining growth. They must also avoid inward-looking policies — particularly on trade — that may damage longer-term prospects for the global economic and financial system. In describing how we reached these conclusions: I’ll begin by saying a few words about the IMF’s “Growth at Risk” approach — a methodology that we recently adopted for assessing financial stability. “Growth at Risk” was first introduced in the October 2017 edition of the GFSR. This approach links current financial and economic conditions to the distribution of future growth outcomes. Using these distributions, we can identify the set of severely adverse growth outcomes (located in the left tail of the distribution of growth outcomes). These are the worst possible growth outcomes, which may occur with small probability (5 percent). We call this metric “Growth at Risk.” We can then track, over time, how this set of severely adverse outcomes changes as financial conditions tighten or loosen. The main advantage of the “Growth at Risk” approach is that it allows us to assess whether changes in financial conditions — and the corresponding changes in the constellation of financial vulnerabilities — will be, on balance, macro-critical. Or in other words, whether today’s policies and financial conditions may increase the odds of adverse outcomes for growth and financial stability in the future. With that background: Let me now focus on our latest global financial stability assessment. Short-term risks to global financial stability have increased over the past six months — as stock-market volatility has risen, and as investors have grown more concerned about geopolitical tensions, especially over trade policy. Looking ahead: The odds of a downturn remain elevated, and there’s even a small chance of a global economic contraction over the medium term — that is, over the next three years. Step by step, let me walk you through our analysis. Compared to six months ago, global financial conditions have tightened moderately. Yet they remain very accommodative, overall, in both advanced and emerging economies. This reflects offsetting shifts in market indicators. Expected short rates in some markets (notably in the United States) have edged higher, and equity-market volatility has increased, leading to some tightening in financial conditions. However, investor risk appetite remains strong, as reflected in the prices of risky assets. Near-term growth prospects continue to look favorable. This is partly because easy financial conditions have dampened — although not eliminated — near-term risks to growth. As you can see here, in the chart on the left: The distribution of one-year-ahead global growth forecasts, conditional on current financial conditions, is shown in orange. In the severely adverse scenario — in the 5th percentile of the distribution — global growth one year from now will be about 3 percent or less. At the same time: The extended period of easy financial conditions has fueled the buildup of vulnerabilities that may put growth at risk over the medium term. In the left-hand chart: The three-year-ahead distribution of growth outcomes, shown in black, is notably more skewed toward the left. This implies that — in the severely adverse scenario — global growth is more likely to be negative three years from now. Meanwhile: As shown on the right-hand chart: The “heat map” puts the current forecast of the severely adverse scenario into historical perspective. It shows that, currently, medium-term risks are well above historical norms. The “Growth at Risk” approach provides a useful framework for examining the potential effects of an escalation of protectionist measures and inward-looking policies. On this slide: The orange line shows our current one-year-ahead baseline forecast. The black line shows our three-year-ahead forecast. The second is an impact on global output over the medium term, where the entire distribution of growth outcomes would shift toward the left — as shown in the dotted black line. This would mean that the range of possible growth outcomes — both central and severely adverse — would be less favorable. With elevated financial vulnerabilities, any shock to the financial system is likely to cause more extensive damage — and is likely to require more significant adjustment. Indeed: Even though the adjustment to U.S. monetary-policy normalization has been smooth so far, financial markets remain vulnerable to an unexpected policy tightening. The term premium remains near historical lows, and financial conditions in the United States have eased, even as the Federal Reserve has started lifting the policy rate. The monetary-policy normalization process has also been accompanied by a weakness in the U.S. dollar — which is not unusual during periods of monetary-policy tightening, so long as overall financial conditions remain relatively easy. However, this means that a higher-than-expected inflation reading could trigger a faster-than-expected tightening of monetary policy and financial conditions. I’ll now outline five of the vulnerabilities that may make the road ahead bumpy. the greater synchronization of house prices. First: Let’s look at stretched asset valuations. Despite the February sell-off in the equity markets, and despite jitters related to trade tensions, stock-market valuations remain elevated. The cyclically adjusted price-to-earnings ratios — the so-called “CAPE” ratios — have continued to rise in many regions: most notably, in the United States. However, volatility has returned. The first spike occurred in early February — what we refer to as “the VIX tantrum.” It was largely confined to equity markets. Currently, equity volatility remains closer to historical averages — reflecting higher uncertainty in the markets, due to increased geopolitical and global trade tensions. Second: Let’s look at the credit quality of borrowers. Credit markets in advanced economies are increasingly showing signs of late-stage credit-cycle dynamics. The global issuance of so-called leveraged loans — made to riskier companies, and to those with already-high debt loads — reached a record $788 billion last year. At the same time, the overall quality of covenants (or investor protections) continued to decline. There are similar trends in credit quality in corporate bond markets, where lower-rated corporates in the United States and in the Euro area now account for a greater proportion of bonds than they did 10 years ago. Third: Let’s look at vulnerabilities in Emerging Markets and Low-Income Countries. Although some Emerging Market economies have improved their fundamentals, many remain vulnerable to a sudden tightening in global financial conditions, and to a reversal in capital flows. Foreign capital flows have remained robust over the last six to 12 months, allowing weaker Emerging Market sovereign issuers to gain access to the markets. As a result, non-investment-grade issuance has risen to more than 40 percent of total Emerging Market sovereign issuance over the past year. Also: In many Low-Income Countries, public debt vulnerabilities have increased. Easy financial conditions have allowed Low-Income Countries greater access to the markets, and their bond issuance has reached record highs. At the same time, the creditor composition has become less borrower-friendly. The share of Paris Club debt has declined from 62 percent to 28 percent between 2007 and 2016 — while the share of external financing provided by commercial and non-Paris-Club creditors has doubled. This could pose challenges for ongoing and prospective debt restructurings, with the potential for unpleasant surprises for private creditors. Meanwhile: Rising debt burdens have increased debt-sustainability risks among low-income borrowers. Today, 40 percent of Low-Income Countries are at risk of, or are already in, “debt distress,” based on the IMF’s debt-sustainability assessment. Fourth: Let’s look at the vulnerabilities related to bank U.S.-dollar liquidity mismatches. Most internationally active non-U.S. banks rely on short-term, or wholesale, sources for about 70 percent of their dollar funding. Those dollar liabilities, moreover, are not always evenly matched with dollar assets, in terms of size or maturity. While most large banks have strengthened their consolidated capital and liquidity positions since the global financial crisis, the non-U.S. banks face structural U.S.-dollar liquidity mismatches. If we compare liquidity ratios aggregated across a large number of non-U.S. banks, we see that dollar-liquidity and stable-funding ratios look notably less favorable than the similar ratios at the consolidated level. Fifth and finally: Let’s look at the greater synchronization of house prices. As policy tightens in the United States and elsewhere, the possibility of a widespread decline in house prices may pose risks to financial stability. Our analysis — presented in one of the analytical chapters of the GFSR — shows that there has been a steady increase in house-price synchronization across countries. Although local determinants of house prices are still the most important factor, greater financial integration means that global factors play an increasingly important role for house-price valuations. Furthermore: We found that house-price synchronization tends to increase sharply in the run-up to a crisis. Therefore: Greater synchronicity can signal a downside risk to real economic activity. To sum up: These vulnerabilities — taken together — may put global financial stability and growth at risk over the medium-term horizon. So there’s the global perspective on current and projected financial conditions. Let’s now turn our attention to specific conditions in China. In recent months, China’s policymakers have taken important steps to reduce risks in the financial system — including tightening the regulatory framework. These efforts have achieved some success in slowing the buildup of bank vulnerabilities. Yet risks remain elevated, and difficult reform challenges are ahead. China continues to face a delicate balancing act between protecting near-term economic growth and ensuring the medium-term stability of its financial system. This chart gives us a stylized view of China’s banks and nonbank financial institutions. These sectors are tightly linked through their exposure to investment vehicles — which are both large (at about 100 percent of GDP) and opaque. On the asset side: These vehicles — such as wealth-management products and similar private fund structures — are largely invested in illiquid corporate debt. But they also provide leverage to banks and other financial vehicles. On the liability side: These vehicles are largely funded by the issuance of investment products. About half of them are sold to investors as high-yielding alternatives to bank deposits. This creates significant maturity and liquidity mismatches. To manage those mismatches, investment vehicles borrow from banks and other funds. Banks are thus exposed to risks in these investment vehicles — as investors, as creditors, as guarantors, as borrowers, and as managers. Small and medium-sized banks and insurers are heavily exposed through on-balance-sheet holdings of these products. This interconnectedness presents a major vulnerability for China’s financial system. It should continue to be a focal point of efforts to rein in financial-stability risks. The recently announced asset-management rules, and other improvements to the regulatory framework, are important steps toward addressing these risks. But implementation will be challenging. There has been some progress in curbing the credit expansion and the growth in linkages between banks and non-banks. Tighter regulations have slowed the growth in investment products — as well as in banks’ intra-financial-sector assets and liabilities. In addition: The slowdown in leverage has tightened financial conditions in the money markets and the bond markets. But the key challenge is to tighten regulations without disrupting growth. When we turn our attention to China’s bond market: Several features stand out. One factor is: Trading volumes have been falling, particularly for credit and rates bonds (which you can see in the red and purple area in the left chart) — even as the market continues to grow rapidly (as shown by the blue line in left chart). More broadly: Trading volumes appear highly cyclical, falling sharply in the wake of bond-market and money-market deleveraging campaigns in both June 2013 and late 2016. As bank-issued, short-term, negotiable certificates of deposit (NCD) trading has risen sharply, there is less and less trading activity for bonds with a residual maturity greater than one year. This suggests a growing disparity between spot-market liquidity at the front end of the yield curve and further out. Taking an even closer look: Bond-market trading activity appears to be closely linked to leverage cycles. Using data from the interbank market: Spot trading volumes are closely correlated with repo volumes — particularly for riskier bonds (see the blue dots, in the chart on the left). Most repo transactions are pledged, not outright — precluding the use of repos for rehypothecation. The correlation is stronger for bonds other than rates bonds, which (except for NCDs) are less liquid — the opposite of what you’d expect to see from market-making activity. Repo volumes are many multiples of spot volumes. If a large share of spot volumes is related to leveraged carry trades, it means that genuine market trading activity — and the price-discovery function of the bond market — is even less than it appears. The imbalance between repo and spot bond-market trading activity could be a source of financial stability risk. As interbank spot turnover has fallen, repo volumes have continued to rise (as you can see on the right-hand chart) — reaching a multiple that is well higher than in the United States and many other countries. If safe bonds cannot be easily sold for cash in stressed markets — but can only be financed through repos — the liquidity of safe bonds is dependent on the balance-sheet capacity and appetite for counterparty risk of others in the financial system. In other words: It is more difficult for the system to collectively deleverage and reduce counterparty risk in times of stress. In instances of widespread deleveraging pressure in China, deleveraging-related selling would also, probably, quickly overwhelm spot markets. That factor may explain why yield-curve flattening or inversion occurs fairly frequently — because only the front end of the yield curve is liquid during episodes of deleveraging. Asset-management reforms, that help remove implicit guarantees, may help reduce distortions in the bond market. This large allocation to higher-yielding bonds may be linked to several factors: The fund industry is largely composed of investment vehicles that benefit from implicit guarantees from sponsors — and they are structured as fixed-yield products that do not face mark-to-market pressures. If reforms can fully unwind implicit guarantees for investment vehicles and increase the use of mark-to-market (NAV) pricing, it may cause important shifts in investor behavior. Without guaranteed fixed yields, investors in investment vehicles would become more risk-sensitive — and they would gradually shift allocations toward safer assets. This would help promote market deepening. But it could lead to shrinking net demand for riskier corporate bonds in the short term — weighing on credit growth. strengthening central coordination and policymaking by increasing the powers of the PBOC and by unifying the banking and insurance regulators. Recently, the authorities announced improved financial-system data collection. Addressing regulatory arbitrage between banking, insurance, and securities businesses — through enhanced functional supervision. New asset-management rules set to take effect this year are a promising blueprint to address key distortions in the financial market — including by targeting implicit guarantees. The gradual phase-in is important, allowing time to address data gaps and strengthen buffers. We believe that effective implementation will be critical. Reforms should be carefully calibrated and properly sequenced, and credit growth should be allowed to decelerate — as this is necessary for financial stability and sustainable growth over the medium term. Ladies and gentlemen, we are pleased to recognize the strong steps that China’s authorities have already taken, and to underscore the IMF’s commitment to continuing to work with you toward reforms that promote greater stability. It has been a pleasure to address you today, and now I’ll welcome any questions you may have. The world economy is enjoying a period of strong economic growth. It is not growing as quickly as it did between 2003 and 2007, but, in view of how that surge ended, we should be grateful for that mercy. 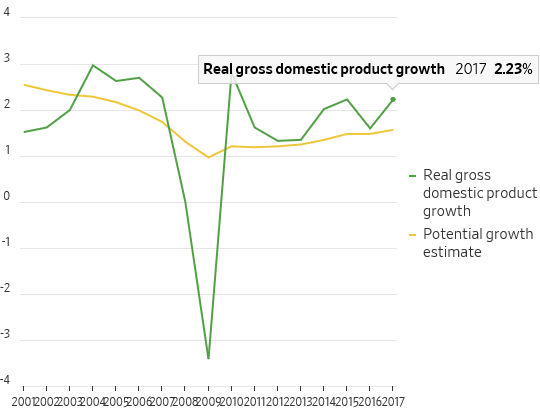 Both growth in 2017 and the growth forecast by the IMF for 2018 and 2019 are higher than in any year since the crisis, except for 2010 and 2011, the years of post-crisis recovery. This, then, is a time of fragile recovery. In its latest World Economic Outlook, the IMF has raised its forecast for growth of the world economy for this year and next by 0.2 percentage points above its forecast in October 2017. The big upgrade is for the advanced economies, up by 0.5 and 0.4 percentage points in 2018 and 2019, respectively. The UK is the only member of the group of seven leading countries to enjoy no upgrade. That is Brexit’s early price. Perhaps most striking given protectionist noises from the US, are upgrades in the expected growth of the volume of world trade. This is now forecast to grow 1.1 percentage points faster in 2018 and 0.8 percentage points faster in 2019. The two main reasons for the strength of the world economy and rising optimism about short-term prospects are that policy remains highly supportive, while the world has avoided any large negative economic shocks since the collapse of commodity prices in 2014 and 2015. Markets expect policy rates to rise more sharply in the US than in October. Even so, monetary policy would not be tight by historical standards: the expected policy rate is below 3 per cent even in early 2021. This optimism is largely because inflation, notably wage inflation, has been quiescent, despite low unemployment. Other high-income economies are far behind the US in their tightening. To a still highly supportive monetary policy we must add the huge pro-cyclical fiscal boost coming from unfunded tax cuts in the US. The Congressional Budget Office forecasts the US federal deficit at an average of just below 5 per cent of gross domestic product between 2019 and 2027. This mixture of guns and butter in a full-employment economy reminds one of the late 1960s and early 1970s. That period ended very badly. The IMF view is not so cataclysmic. It merely argues that the US fiscal policy has borrowed growth from the future. What are the risks to such a benign view of the future? In the short term, argues the fund, they are balanced. On the upside, strong confidence might lead to a bigger than forecast boost to both investment and consumption. Stronger investment might also lead to stronger productivity growth and so lower than expected inflation. On the downside, the unpredictable policy environment and associated market turbulence might trigger a big reduction in confidence and so weaker demand. One vulnerable place might be the eurozone, where, as Gavyn Davies notes, growth is now slowing unexpectedly. In the longer run, however, the risks seem weighted to the downside. True, we might be at the beginning of a period of sustained and fast growth driven by a delayed upswing in productivity growth and convergence between advanced and emerging countries. Yet the downside risks are more potent. Yet, if inflation were to surprise on the upside, monetary policy tighten more sharply than expected and term premia in bonds jump too, debt problems would re-emerge, perhaps disastrously so. If that were to happen, the room for response by central banks would be limited. Also, notes the IMF, the rapid growth of “crypto assets” and breaches in cyber security may yet prove destructive. Furthermore, there is profound global political tension. The ludicrous intellectual framework of US trade policy is displayed in the forecast that, far from shrinking, the US current account deficit will expand as a result of the fiscal boost. That would not stop Donald Trump, US president, from blaming perfidious foreigners. As Maurice Obstfeld, the fund’s economic counsellor, notes in a remarkable sentence: “The multilateral rules-based trade system that evolved after World War II and that nurtured unprecedented growth in the world economy needs strengthening. Instead, it is in danger of being torn apart.” The IMF was a product of wiser times. It is right to remind us of that. At a time when a rising superpower challenges the incumbent — and when the latter has turned against the very global system it created — complacency would be absurd. If one wishes to understand the politics behind this disarray, a glance at the chapter on labour force participation in advanced countries would help. Labour force participation of men fell in almost every high-income country between 2008 and 2016, while that of women rose almost everywhere. This is not a socially benign way of achieving greater equality between the sexes. Furthermore, the US has not even managed that increase in women’s labour force participation. Its labour market has been a disaster. This is just one aspect of a broader lesson: a house so economically divided cannot stand. A decade ago, we experienced a crisis in the global system. But policymakers prevented it from becoming a crisis of the system. Now, at a time of cyclical recovery, we are facing just such a crisis of the system. Ours is in an era of economic and political fragility. The recovery is real. So, alas, is that fragility. 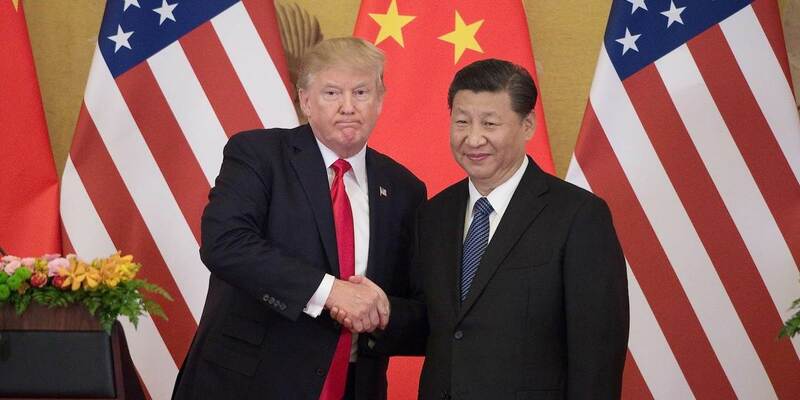 BEIJING – Last month, US President Donald Trump enacted steel and aluminum tariffs aimed squarely at China. On April 2, China retaliated with tariffs on 128 American products. Trump then announced 25% tariffs on another 1,300 Chinese products, representing some $50 billion of exports. In response, China threatened 25% tariffs on 106 US exports (including soybeans, cars, and airplanes), to go into effect whenever the US tariffs do. Yes, if these measures go into effect, it will amount to a trade war – one that the United States is not likely to win. That is certainly true of China, which holds well over $1 trillion of US Treasury securities. Of course, if the Chinese government dumped its US holdings, the resulting price decline would hurt both countries. But that doesn’t invalidate the point. China does not necessarily even have to sell to wield influence. With US debt expanding and interest rates on the rise, even rumors that the Chinese might stop buying Treasury securities could be enough to drive down US bond prices and accelerate the increase in US interest rates. This would further undermine confidence in financial markets, which are already unhappy with Trump’s trade war, responding to every tariff announcement with a selloff. But there are even deeper reasons to believe that China won’t give in to Trump. Both the US and Chinese tariffs will significantly hurt Americans. For example, Trump’s tariffs on steel and aluminum will force the US auto industry to raise prices for consumers as its major inputs become more expensive. China’s retaliation hurts other important US economic sectors, from agriculture to manufacturing. While industries and consumers in China would also be hurt by a trade war, that country’s leaders can overrule interest groups and stifle protests. In any case, public opinion will largely back retaliation against the US. The Chinese remember well the Opium Wars of the nineteenth century, when the Middle Kingdom tried and failed to resist the British campaign to force it to open its economy to opium and other imports. The so-called Unequal Treaties that emerged from that campaign were part of China’s “century of humiliation,” the transcendence of which is as important to modern popular Chinese consciousness as the word “liberty” is to Americans. Overcoming the legacy of humiliation is possible only if China refuses to back down in the face of trade bullying. Add to that Trump’s reputation for flip-flopping, and the odds that Chinese leaders would bother making a deal with Trump to change their country’s trade policies seem small. Even if China did decide to concede something to Trump, it would not be meaningful. For example, in response to Trump’s demand for a reduction in the bilateral merchandise trade deficit, China could export less merchandise to the US directly, instead routing products through Taiwan and other countries, where some final assembly could take place. The result would be economically meaningless; but so is the concept of the bilateral deficit itself, as Chinese exports to the US contain a high proportion of intermediate inputs produced in South Korea, the US, and elsewhere. What really matters is that China’s current-account surplus has been falling since 2008, and now stands at a relatively small 1% of GDP. America’s external deficit is growing, but that is the result not of trade policy; it stems from Republicans’ fiscal policy, which is blowing up the budget deficit and reducing national saving. As for Trump’s complaints about China’s IP “theft,” there are some valid grievances on this front. But addressing this issue requires technical expertise and negotiating skill, not blunt threats based on inadequate knowledge. Crucially, it would also require cooperation with other partners who have similar grievances with China, ideally including pressure applied through rules-based institutions like the World Trade Organization. Trump is pursuing the opposite strategy, arguing that neither multilateralism nor bilateral negotiations work with China. Yet such tactics have helped to compel China to allow a 37% appreciation of the renminbi in 2004-2014 and to crack down on counterfeiting of US merchandise and theft of US software. 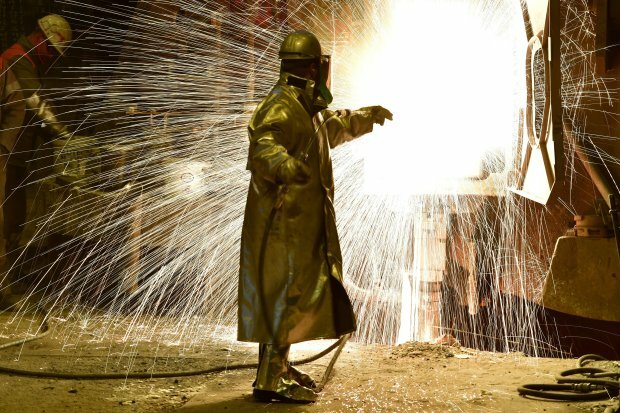 In any case, the shortcomings of existing trade institutions do not justify resorting to aggressive and ineffective unilateralism. That did not work in the 1980s, when Ronald Reagan’s so-called Voluntary Export Restraints on Japanese goods ended up benefiting Japanese firms, rather than the US, which was better off after they were removed. Nor did it work in 2002, when George W. Bush imposed steel tariffs that cost many more jobs than they protected. Trump may also want to avoid the WTO because the US doesn’t win all of the cases it brings there. But it does have a 90% success rate. And it is not as if the US has never violated international rules; its recent moves amount to clearer violations of those rules than the Chinese policies to which they are supposed to be a response. Although China may offer Trump some face-saving gesture, substantive concessions are unlikely. Trump’s war will do nothing to improve America’s external balance, output, employment, or real wages. No amount of gleeful photo ops, self-congratulatory tweets, or triumphant Fox News reports will change that. Jeffrey Frankel, a professor at Harvard University's Kennedy School of Government, previously served as a member of President Bill Clinton’s Council of Economic Advisers. He is a research associate at the US National Bureau of Economic Research, where he is a member of the Business Cycle Dating Committee, the official US arbiter of recession and recovery. South Korean President Moon Jae-in said that Donald Trump deserved a Nobel Peace Prize for his efforts at bringing North Korea to the bargaining table over the country’s nuclear weapons programme. Mr Moon’s praise for the US president — whom he credits for successfully putting pressure on North Korea — comes as he seeks to capitalise on the momentum of last week’s historic summit with supreme leader Kim Jong Un. It also comes amid signs of divergence between Seoul and Washington, which has indicated a tougher approach to Pyongyang. “President Trump should win the Nobel Peace Prize. What we need is only peace,” Mr Moon told a meeting of senior secretaries, according to a presidential official who briefed media on Monday. Park Ji-won, an opposition party lawmaker, backed the proposal, saying: “I believe that president Trump will be able to win the Nobel Peace Prize if he indeed resolves North Korea’s nuclear problem, which is one of the biggest global problems”. On Sunday North Korea promised to close its nuclear test site next month and invite foreign inspectors to verify the closure. The pledge came as the joint statement announced by the two Koreas following Friday’s summit was criticised for lacking specifics, increasing doubts over Pyongyang’s commitment to denuclearisation. Seoul’s presidential Blue House said that Mr Moon’s plan to brief Mr Trump on the summit was likely to be brought forward so that it could happen before the US president meets Mr Kim in coming weeks. Seoul’s concerns about possible difficulties at the US-North Korea summit intensified after John Bolton, US national security adviser, reaffirmed Washington’s refusal to offer incentives before Pyongyang relinquished its nuclear weapons. The date and the venue for the planned summit have yet to be decided, although Mr Trump said the highly anticipated meeting would probably be held in the next three or four weeks. In an interview on Sunday with Fox News, Mr Bolton said that Mr Kim must abandon his “entire nuclear programme” before any sanctions against Pyongyang were lifted, and mentioned Libya as a model to resolve the nuclear stand-off. “We have very much in mind the Libya model from 2003, 2004,” Mr Bolton said, adding that Washington had no plan to ease its campaign of pressure because that was what had brought Pyongyang to the negotiating table. “Relieving that pressure isn’t going to make negotiation easier, it could make it harder,” he said. Mr Bolton’s comments bode ill for any breakthrough on how to make Mr Kim put his words on denuclearisation into action, South Korean experts said, given that Pyongyang had insisted on a more gradual “action for action” approach. Mr Kim is thought to regard his weapons programmes as an asset that contributes to the survival of his family’s dictatorship. Muammer Gaddafi, then Libyan leader, announced he was abandoning weapons of mass destruction in 2003. But in the midst of the Arab uprising in 2011 he was overthrown by rebels — who were supported by air strikes carried out by the US and other Nato powers — and captured and killed. he Blue House declined to comment on Mr Bolton’s comments. But some experts said Mr Trump was likely to tone down Washington’s stance and try to find a middle ground in his meeting with Mr Kim to ensure that the summit was a success. China foreign minister to visit PyongyangBeijing on Monday said that Wang Yi would visit North Korea later this week — the first time a Chinese foreign minister has made an official trip to Pyongyang since 2007, writes Charles Clover. Beijing has lauded efforts to engage North Korea, including Friday’s Inter-Korean summit, but is also eager to ensure that no deals are struck without its input during the bilateral meeting between Donald Trump and Kim Jong Un. “China wants to be included in this process as soon as possible,” said Zhao Tong, an expert on the Korean peninsula at the Tsinghua Carnegie Centre in Beijing. One of China’s concerns, he said, was that the Panmunjom Declaration — signed by both Korean leaders on Friday in an effort to put a formal end to the Korean war — proposes holding trilateral meetings between the US, North Korea and South Korea, as well as quadrilateral meetings that include China. “The trilateral format would exacerbate China’s concerns about being left out,” said Mr Zhao. China is also anxious about being excluded from international inspections teams that could be sent to North Korea to oversee any disarmament processes, he said. Mr Wang’s visit was likely to be an attempt to secure Beijing’s continued influence with Pyongyang, Mr Zhao said. “China foresees that strategic competition and rivalry with the US will continue to grow, and it will be imperative to ensure that a nuclear-capable North Korea would not develop a closer relationship with the US than with itself,” said Mr Zhao. How Fast Can the Global Economy Go? The world economy has found the accelerator pedal of late. But for policy makers and markets, an important question is what is happening to potential growth, a sort of speed limit for the economy. Global growth is set to reach 3.9% in 2018 on the International Monetary Fund’s latest numbers out Tuesday, boosted by stronger expansion in advanced economies and the fastest since 2011. The good news is that the IMF thinks only 40% of the better-than-expected growth in advanced economies in 2016 and 2017 relative to its 2016 forecasts is down to a cyclical rise in demand, with the rest down to higher potential growth. That implies the expansion is more sustainable: it isn’t all down to a surge in demand, but also reflects expanded supply. It helps explain the way in which inflation hasn’t risen much even as growth has accelerated and unemployment has fallen: a combination that has been extremely good for investors. In all, the IMF estimates potential growth has picked up by 0.4 percentage point between 2011 and 2017 for 10 large advanced economies--the Group of Seven plus Australia, South Korea and Spain--to about 1.6%. That remains well below pre-crisis levels of 2% to 2.5% because the contribution of labor and capital stocks to potential growth remains weak. Demographic headwinds, in particular, may weigh on growth. This debate might seem arcane in a world worried about a trade war between the U.S. and China, and geopolitical clashes with Russia. But the underlying strength and persistence of growth and the stability of inflation are vital factors supporting the relative health of markets lately. The message that potential growth has recovered a little is encouraging, but investment is the thing to watch. Without it, the world economy might be stuck in the slow lane.